Here is my update: All changes and additions colored. And for my own sanity because otherwise I still get overwhelmed, I will from now on also declare priorities. I am glad with everything I work on, but maybe this will help some more. Q1: Finished! Now I just need to gift it. Click here for the blogpost. Q4: The quilt No. 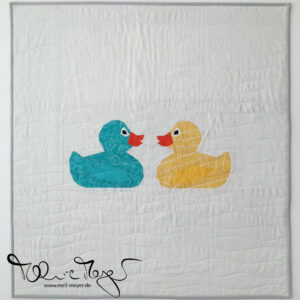 2 is now quilted. The binding yet to be finished. Q1: Finished! Click here for the blogpost. Supposed to become something different, I have now decided to change this unwanted project into a baby or toddler quilt. At the moment without an individual in mind – maybe to be a charity quilt. At the moment I have a lot of four patch blocks in kona cotton solids. Q4 + Q1: Unfortunately no progress. Q1: Finished the blocks for January/ February. 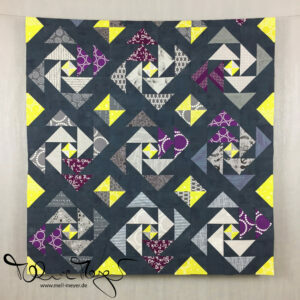 No blog post – but I will „one day“ put up a „bee block page“. The blocks for March/ April are almost finished. Post probably next week. NEW: Test out the block I have chosen for my month, because I am up next: May/ June. And then finish some and post the instructions for my bee members. This quilt is for the baby of dear friends, it is really new in the making. We are still debating fabric and pattern. 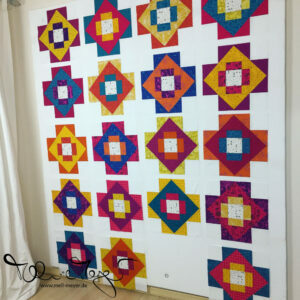 Q1: They have decided on a a pattern, it will be Hopscotch by Camille Roskelley @ Thimble Blossoms. And they have picked the fabrics. I have already started cutting and am finished with the trapezoid shapes. The deadline is the end of May. Hmmm… seven projects to push you on ; ) Looking foward to seeing a few of those high priority projects get pulled out. Should I send you more video links?